We are socked and sadden to see images of devastation caused by the recent earthquakes in Nepal. The human consequences of such devastation is unmeasurable but, it is estimated that, more than 8000 people lost their lives, over 20,000 people injured and hundreds of thousand people became homeless. Greenwich has one of the largest Nepalese communities in London, for whom this is a desperately worrying time. We are very grateful that The Royal Borough of Greenwich has stood by us and help us collect relief materials to support the victim so of the Earthquake. Local residents come along and gave their volunteer times and help us out in sorting the donated items and individuals and corporate donors came forward to donate towards shipping cost. 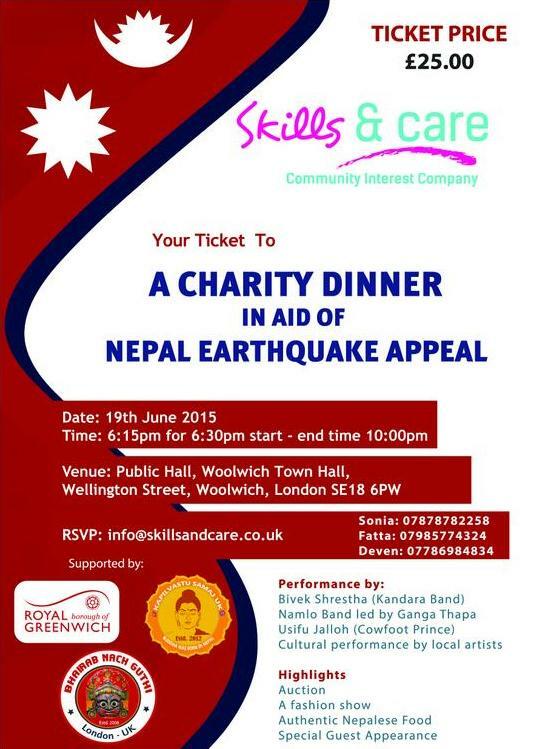 Skills & Care CIC with support of Royal Borough of Greenwich, Kapilwastu Samaj UK and Bhairavnath Guthi UK is organising a Charity Dinner in aid of the earthquake. The fund generated will be used to provide shelter, food and emergency medical supply to the victims of the earthquake. Fashion show, Auction. Raffle Draw, Authentic Nepalese Food.